Mature Compost is a stable humus material created by: combining organic wastes (e.g. Yard trimmings, food wastes, manures) in proper ratios into piles, rows, or vessels; adding bulking agents (e.g. Wood chips), as necessary, to provide air space; controlling temperature, moisture and oxygen to achieve accelerated decomposition; and allowing the finished material to fully stabilize and mature through a curing process. Decomposition is performed by naturally occurring microorganisms (e.g. bacteria, fungi) that utilize the organic materials for their food and energy sources. Proper primary composting involves temperatures between 110 and 150 degrees Fahrenheit, moisture content between 50 and 60%, and adequate oxygen for the microbes. It is complete when pile temperatures decline and remain below approximately 105 degrees Fahrenheit. 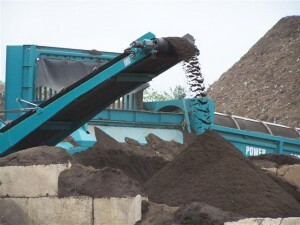 A subsequent curing period of 2 to 6 months is required for the compost to mature, after which it will not overheat or produce unpleasant odors during storage, and can be beneficially used. Sources: A.H. Christian & G. K. Evanylo, Extension Specialists, Department of Crop & Soil Environmental Sciences, Virginia Tech; R. Green, Office of Solid Waste, U. S. Environmental Protection Agency; Organics Recycling and Composting Committee (ORCC) of the Virginia Recycling Association. (VRA).